Within Kagerou, there exist certain dragons that have been sealed away by the Dragon Emperor for their crimes. These criminals, normally housed in the underground Magma Prison, have been granted parole in a controversial mass counterattack against the invasion of Link Joker. BT11: Seal Dragons Unleashed discharges fourteen of their number, and while it will take skilled play for Kagerou cardfighters to properly break their seals, those very imprisoning mechanisms can also be used to enhance the fighting power of a Seal Dragon deck. The subgroup's first vanguard is Seal Dragon, Terrycloth. Once a revolutionary that rebelled against the empire, Terrycloth in his sealed form has had his body and magic rewound three thousand years. While that seal is in theory indefinite and meant to assist a life sentence, Terrycloth still has access to some of his magical power. His especial counterblast soulcharges himself, then retires an opponent's rearguard; the opponent can then look at up to four cards from the top of their deck and superior call 1. Note that even if the opponent chooses to look at up to zero, they still have to shuffle their deck, so this ruins the deck stacking strategies of Tsukuyomi and Mandalalord. Also note that Terrycloth is the key to a specific Seal Dragon combo. The majority of Seal Dragons specialize in retiring grade 2 units for cheaper costs than standard Kagerou cards would pay to retire any unit, attempting to pay less and then gamble that the opponent does not get a different grade 2 off the top of their deck. However, Terrycloth can retire any unit, allowing you to force the opponent to replace a grade 0 or 1 in a boosting position with a grade 2, which locks up their field. Furthermore, the Vanishing Field skill of this deck's key card prevents the opponent from intercepting, which completes the lock by forcing them to guarantee you a cheap retire by removing the grade 2 that your skill called. The point to be wary about with Seal Dragon retire skills is that they will also activate "when this unit is called" autoskills; so you could for example, end up superior calling a Blaster Blade that then retires one of your units, or a Nemain that reinforces the opponent's hand, or even end up helping the opponent to superior ride on your turn by calling a Lop Ear Shooter that they then combo with Pellinore. There's a lot of risk involved with sealed magic, and part of the reason that the magic of these cards is forbidden in the first place is because it operates in a completely different way from every other skill type in the game. To better feed its consistency, the Seal Dragons have imported LaLa's skill for their own purposes. Seal Dragon, Kersey is a base 7000 grade 1 that when called can drop a card from your hand to draw one if the opponent has a grade 2 vanguard or rearguard. This condition plays back into the mechanics of sealed magic, letting you play the same old Kagerou tricks of concealing the cards in your hand by card changing drive checks and searching for key parts of your strategy without having to leave it in the opponent's hands with Aermo or losing out on a booster through Gojo. Kersey is also important as a damage check, as Seal Dragons are reliant on counterblasts of units with "Seal Dragon" in their name to use their skills. Offensively the Seal Dragons have grade 1 and grade 2 units that match each other's skills, both getting +3000 power on-attack when you have a Seal Dragon vanguard. Flannel and Jakado operate off of 7000 and 9000-power bases, which assists in making flexible 18000-power lines for assailing crossrides as well as forming a 20000 line between Jakado and Bahr for fighting CoCo and contemporary base 10000 vanguards. Note that while this last point is the traditional application of Masquerade copies, BT10, BT11 and DG01 have all reinstated 11000 bases as the competitive power of the format and base 10000 grade 3s are rare. Because of this and the proliferation of subgroups, early game offense is more of a priority and you will likely need Flannel more than you will Jakado. Corduroy is the star of this build's grade 2s. An insane dragon, Corduroy was dissatisfied with run-of-the-mill dragon magic and turned to investigating the cursed black arts to feed his unending greed. When called or ridden he can counterblast 1 Seal Dragon to retire one of the opponent's rearguards, and from there the skill operates exactly the same as Terrycloth. This is important because while Terrycloth interacts as turning your advantage from +1 to 0 to either give the opponent a -1 or -0 with weaker field setup, which means that at most you can get no card lead out of it and at worst be put behind two cards--even more if the grade 2 the opponent calls retires one of your units--but Corduroy is always a -1 or -0 to the opponent without giving an inherent loss to your own advantage. Mirror matches with him get silly fast though, because you can end up with scenarios where you Corduroy an opponent's rearguard and they respond by Corduroying your Corduroy and you're Corduroying their Corduroy and it goes in a loop until you're both out of Corduroys and counterblast or someone fails to find a grade 2 in the top 4, because neither one of you wants to miss a chance to put the other behind one card. The vanguard that ties the deck together is Seal Dragon, Blockade. While he only has a 10000 power base in a clan of 11000-power units, Blockade's Vanishing Field stops the opponent from intercepting during your own turn. Blockade is paired with Seal Dragon Chambray as his custom booster. While not strong individually, Chambray is the servant of Blockade whose research serves to fuel control and the expansion of the Vanishing Field, and when he boosts Blockade he can soulblast 1 to give the Seal Dragon an additional +6000 power over Chambray's 4000 base, in the style of Apocalypse Bat. When coupled with the 3 soul from Terrycloth returning below your vanguard, this allows for several turns of a consistent 20000-power line. Unlike Apocalypse however, the Seal Dragons have no Macha to run Chambray as a tech with, so actually getting that line out is much more difficult. Blockade himself has two forms. In his sealed form the Vanishing Field can only be momentarily expressed, but BT11 finally opens up the ability to unseal the original Sealed Dragon. In his crossridden form as Hellfire Seal Dragon, Blockade Inferno, his cursed magic runs wild and the Vanishing Field with that. Having a continuous 13000 power base for having the original Seal Dragon in the soul means a 21-23000 power line offensively and a defense that shrugs away anything under 18000 power, but thanks to the developments of the format up to Blockade Inferno's release, this is no longer as useful a bonus as it once was. Within the break ride format, where the same setup that is given to crossrides can guarantee +10000 power to the vanguard on multiple turns and similar gains be applied to the rearguards between most clans, where every clan has access to easy 18000+ lines as a matter of course instead of as a special exception, crossride defense is simply not relevant anymore. Most break rides gain +2000 power on-attack while having an 11000 base to work with, which means 23000 with base 10000 boosters that are becoming increasingly common, their subgroup rearguards are base 9000 units that jump up to 12000 on-attack and can go for 18000 with very nearly any grade 1, and as a whole crossrides no longer have an impact. That said, Blockade Inferno is one of the few units to actively benefit from this mechanic even in the postcrossride era, because his only other skill is a limit break 4. Since this skill isn't accessible until the middle to the end of the game, being able to use Blockade first to lock down those grade 2s on the opponent's field helps pace him and prevent you from overextending yourself too early. Missing the initial form of a limit break crossrides is a critical problem because you are working with an 11000-power vanilla and are completely at the opponent's mercy to activate that unit's skills. The faster pace of the break ride format helps ease the problems associated with this, but because of these characteristics the card is not timeless. Future formats may see the pace cool down once again while continuing to make crossride defense a broken shield, decreasing Inferno's playability. Blockade Inferno's limit break is to counterblast 2 Seal Dragons, then retire all of the opponent's grade 2 rearguards and get +10000 power until the end of turn. With Bahr, that's a 31000 power line, but the field control is the more important factor here. The setup that has been established thus far is to use Terrycloth and Corduroy to retire the opponent's grade 1 and grade 0 units, replacing them with grade 2s that help lock down the field, then keep them trapped there with Blockade. After crossriding Blockade Inferno, you then take advantage of this through his especial counterblast to destroy those units that you locked into the opponent's field, giving them up to a -3 in a good game and potential field wipe on the extreme end. As a radical evolution of Berserk Dragon's mechanics, this is easily one of the best control skills in Cardfight as a whole and a prime example of how a limit break can be used to its greatest effect. Certain clans like Tachikaze can counteract this strategy by retiring their units on the preceding turns to pay costs, but because the setup is flexible enough to be conducted either throughout the game or on-the-spot by saving Corduroy and Terrycloth for the moments before your limit break it's very difficult to fight back against a skilled Seal Dragon cardfighter. While Blockade Inferno is the boss card of the Seal Dragon build, it is not the end-all source of the play style's momentum. The deck is very firmly a combo deck that demands both rapid and smart play, defined by how its rearguards work together with the vanguard. Because the counterblasts that the deck is reliant on are all especial counterblasts, finding the right mix of sealed and nonsealed units takes practice and experimentation. 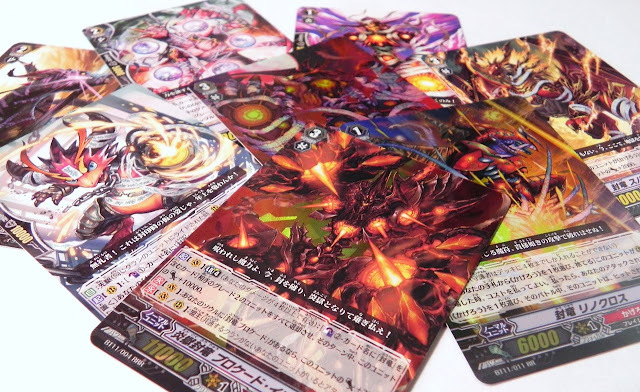 The deck has been relatively slow to be adapted by Japanese pros, but in the month since BT11's Japanese release it has already begun to compete at higher levels than The End is capable of. Two pros use this build.